With their home town of New York still resounding from celebrations held earlier this year in commemoration of the Broadway premiere of OKLAHOMA! 50 years ago, Rodgers & Hammerstein's Golden Anniversary momentum will keep rolling through the 1993-94 season. Starting things off will be the Roundabout Theatre's production of A Grand Night For Singing!, Broadway's first compilation of Rodgers & Hammerstein material. As the first musical to follow Roundabout's highly successful summer '93 revival of SHE LOVES ME (see Sheldon Harnick story), A GRAND NIGHT FOR SINGING!, will play October 13 through January 2. The production team, still being assembled at press time, is slated to include cast members Victoria Clark, Jason Graae, Alyson Reed, Martin Vidnovic and Lynne Wintersteller. Walter Bobbie will direct, with orchestrations by Michael Gibson, musical direction by Fred Wells and a design team headed by Tony Walton. A few years ago, New York City Opera officials were mulling over their options for seasonal family entertainment. They had a complete production of CINDERELLA in their warehouse, but it was for the rarely-heard Massenet opera CENDRILLON, and there was little interest in reviving it. But then an ingenious plot took hold: Rodgers & Hammerstein's 1957 television musical CINDERELLA follows the traditional story, and can be adapted to the stage, so why not make a switch? - same glass slipper, same pumpkin coach, different score. And so, this November New York City Opera's warehoused CENDRILLON will be transformed into the professional New York debut of Rodgers & Hammerstein's CINDERELLA. Robert Johanson will direct, working from a script adapted by Steve Allen. The cast, at press time, is slated to include Crista Moore (Cinderella), Nancy Marchand (Step-Mother), Alix Korey and Jeanette Palmer (the Step-Sisters), George Dvorsky (The Prince), Sally Ann Howes (the Godmother), and George S. Irving and Maria Karnilova as The King and Queen. CINDERELLA will begin performances at the New York State Theater, Lincoln Center, on November 9. Welcome to the first issue of our newsletter. We've talked about having one for several years, and I am very happy that it has become a reality. 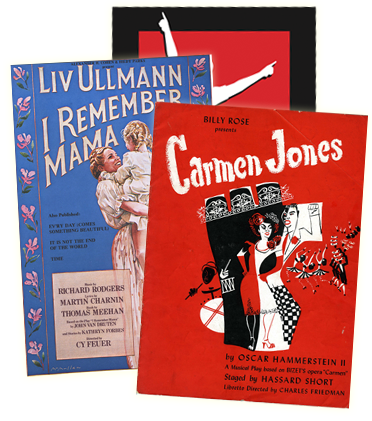 What we will attempt to do in this newsletter is share news and information about The Rodgers & Hammerstein Organization - who we are, what exactly it is we do, how we can be of help to you - and delve into varous aspects of our business with detailed articles and interviews. We have long admired (and studied) the newsletters of our compatriot offices, and have hopefully created a publication unique to us and friendly to you. 1993 marks the 50th anniversary of the Rodgers and Hammerstein collaboration. What better time in which to begin publication? Our newsletter will be published 3 times a year, and the format will continue to evolve. If you have any comments as we go along, please feel free to write to our editor, Bert Fink.